Stitch a great bag to take to events, etc. in the hoop. Many types of events require you to display a name badge while attending an event. The standard size of badges are 4" wide x 3" high and they fit into the vinyl pocket. Behind the vinyl pocket is a fabric pocket that's great for carrying business cards or collecting them. 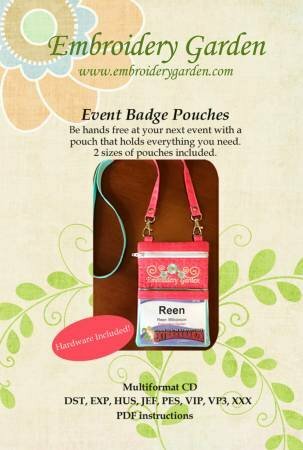 Personalize your pouch if desired. Put your valuables in the zippered pocket and your cell phone in the pocket on the back side. Multi format CD. 5x7 and 6x10 hoop sizes included. Cutting and prep of the fabric will be done in class. If you are registered to attend the Heyde March Extravaganza, you can purchase the design for half price. Materials Included: Class fee includes use of our machines. Requirements: Must purchase pattern and fabric. Fabric requirements (for large badge): exterior fabric 1/2 yard, lining 1/4 yard, 1/4 yard Pellon 988 (or any light weight sew in fleece), 1 piece of 12 gauge vinyl 7 1/2" x 4 1/2". Will need additional fabric if using directional fabric. Additional materials: 2 D rings 1/2", 2 swivel hooks 1/2" and 1 coordinating zipper. (9" for small and 12" for large. Larger zippers can be cut down.) Bring coordinating embroidery thread, bobbin with embroidery thread, clips, pins, scissors, rotary cutter, Dritz Wonder Tape (optional) Note: do not use a thicker batting such as Warm and Natural as it will make the pouch harder to turn.